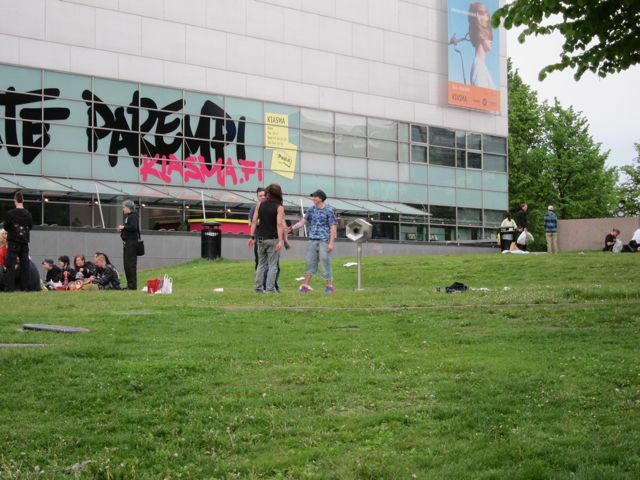 Welcome to our summer picnic by the Megaphonebooth, on Kiasma lawn, on Tuesday 15.6 klo 18.00! ´Megaphonebooth Kiasma-nurmi' by Erik Sandelin & Magnus Torstensson from Unsworn Industries (SE), is a coin-operated megaphone installed in the Kiasma lawn until the end of June. We are lucky as Magnus and Erik from Unsworn Industries will be around at the picnic. We will provide some picnic basics but you should anyway bring some own food + drinks! And don't forget your 1e coins to try out the Megaphonebooth! We hope you can join us!